Pasta alla carbonara is a wonderful thing. It’s cream and egg, warmed slightly, then tossed with parmesan cheese, bacon and pasta hot enough to finish cooking the cream and egg. The pasta is usually either spaghetti or fettuccine. It is a showstopper when you toss the pasta and sauce at the table while guests look on with eager anticipation. The scent of parmesan hitting the hot pasta is captivating. 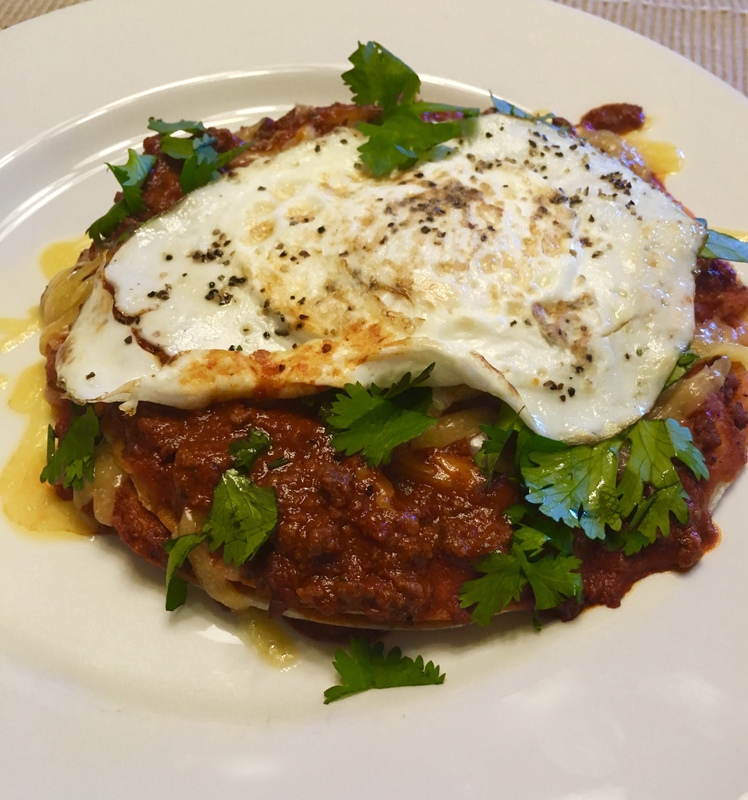 This dish is so rich and wicked that I rarely make it. When I do, there’s never any left over and we always use a chunk of baguette to get the last bit of creamy sauce out of our bowls. I ran across a recipe for a raw corn carbonara that whetted my appetite. It is so very good I made it two nights in a row. Of course I did a little tweaking the second night. The first night I made a half recipe and used it as a side dish. That was a night of experimentation. Other elements in the experiment were fried green tomatoes two ways and a Williams Sonoma rub based on dried Sriracha hot sauce. 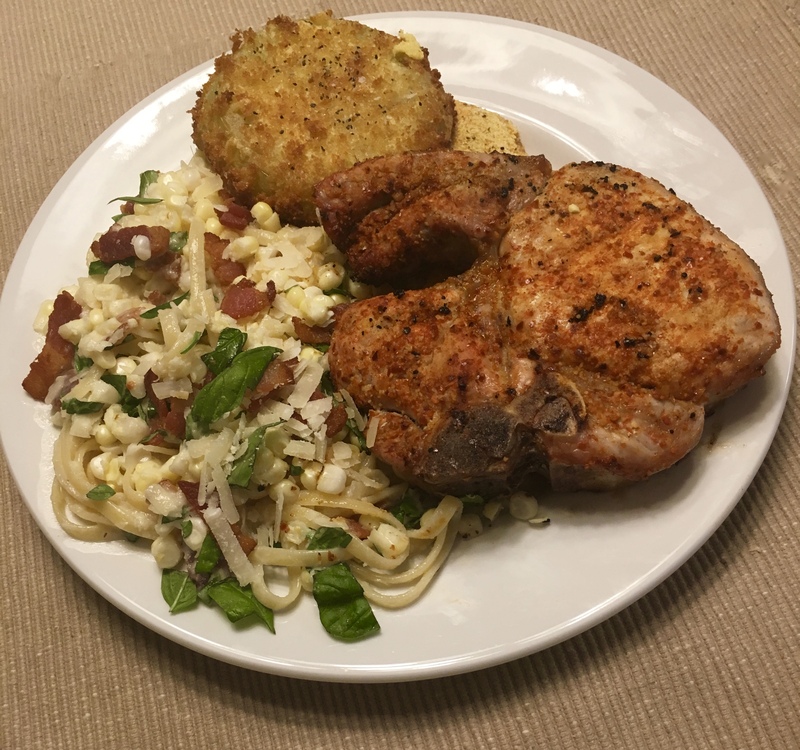 From left, Raw Corn Carbonara, fried green tomatoes, two ways, and a new rub on pork chops. I’ll be making fried green tomatoes at our local farmers market in September. It is something I do for the Master Gardeners every fall. I slice big green tomatoes about 3/8 inch thick, dredge them in white flour, dip in egg beaters and finally in corn meal. I fry then in canola oil until the crust is golden crisp. My fried green tomatoes warm a southern guys heart! I did a coupe of tomato slices with corn meal and then tried a couple of slices with panko crumbs. I really like the crisp panko crust and my next plan is to mix corn meal and panko so I’ll have the crunch and the corn meal flavor. I mentioned getting my meat cutter to start cutting thick pork chops again. He’s still doing it so I showed my gratitude by buying more. I used the Sriracha rub generously on both sides of the chops and let them sit about half an hour. I seared the chops on one side of my grill, then transferred them to the other side where I had not ignited the burners. I closed the lid and let them finish in the indirect heat. It keeps them moist and tender that way. Who can top a meal that has both bacon and pork chops on the plate! Four servings; the recipe can easily be halved. Cook spaghetti in a large pot of boiling salted water, stirring occasionally, until al dente; drain. Meanwhile, fry bacon in a large skillet over medium-high heat, stirring occasionally, until crisp. Using a slotted spoon, transfer bacon to paper towels to drain (reserve fat). Shuck and remove the silks from the corn and, holding it upright in a shallow bowl, cut the kernels off the cobs. Scrape excess corn milk from cobs over the kernels by firmly running the back of a chef’s knife down the sides. Add cream, half of the corn kernels, 1/4 tsp. salt, 1/4 tsp. pepper, and 2 Tbsp. reserved bacon fat. Purée until a smooth sauce forms. Toss hot pasta with corn sauce, 1/2 cup Parmesan, and half each of the remaining corn kernels, bacon, and basil in a large bowl. Divide pasta among bowls and top with remaining corn kernels, bacon, and basil. Season with pepper and top with Parmesan. The second time around, I again made a half recipe. 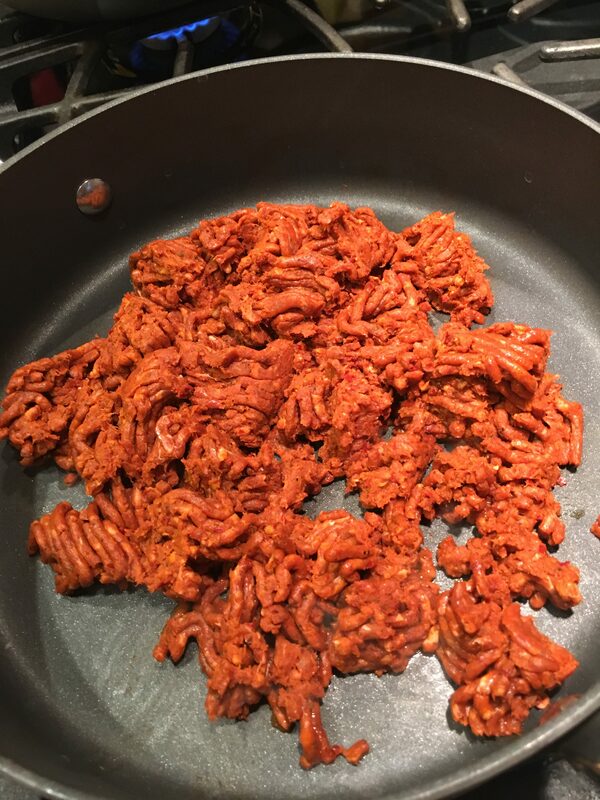 I substituted 3 oz prosciutto chopped and crisped a bit in a fry pan. There were virtually no drippings, so I tossed a couple of teaspoons into the blender with the corn and cream. This dish with a simple side salad would have been great as a meal. Of course, I had to mess with it a little bit. I admit I am a great fan of Williams Sonoma rubs and have at least half a dozen different ones in my pantry. I got out the Meyer lemon and ground pepper rub and sprinkled it on raw shrimp. I let them sit at room temperature while I made the carbonara, then gave them a quick sauté and served them as a protein garnish on the pasta. 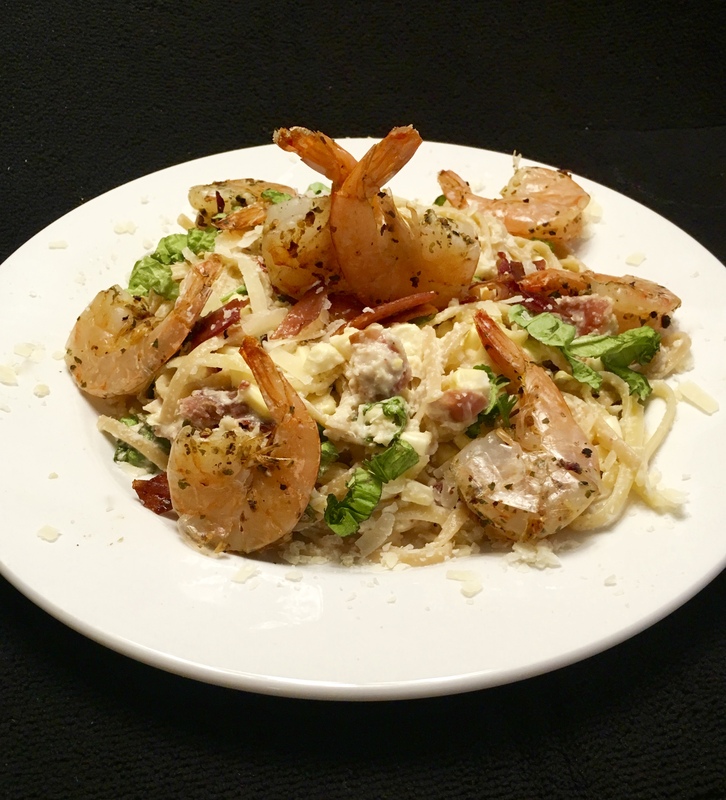 Tweaked Raw Corn Carbonara and Lemon Pepper Shrimp. This raw corn version of a carbonara is sweetened by the fresh raw corn and, because it doesn’t have egg and only has 8 oz cream in the whole recipe (a quarter cup in the half recipe version) it more guilt free than the true carbonara. 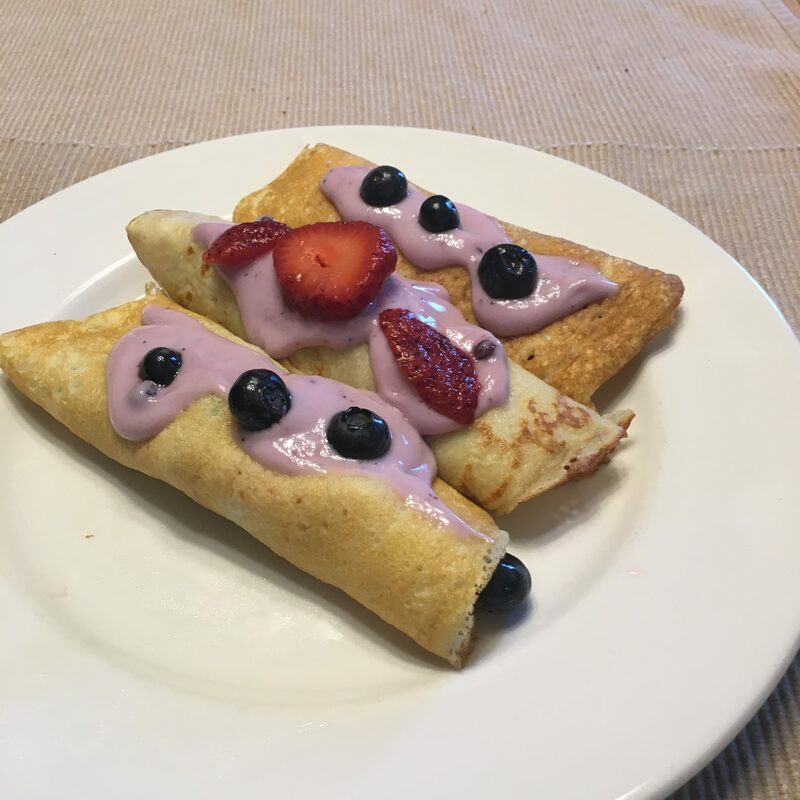 Crepes – Sweet and Savory, What’s Not to Love? Sunday morning, I needed to use some macerated strawberries and fresh blueberries that were waiting in the fridge. Rather than top a bowl of cereal with them, I decided to make crepes. Crepes sound difficult but are only as hard to make as you want them to be. I use a very simple recipe that works with minimal hassle. After enjoying the berry crepes for breakfast, I still had about half a recipe of batter left. A fond memory of a crepes treat years ago inspired me to experiment. Strawberry and Blueberry crepes in a strawberry yogurt sauce. Back in the 1980s, the Hotel Paso del Norte was renovated and expanded into an El Paso showplace replete with a Tiffany glass dome over what had been the lobby and now is a bar. After the renovation, the historic Trost designed hotel became the Westin Paso del Norte*. I had the pleasure of organizing a number of functions there for the then Texas Tech Regional Academic Health Center at El Paso. I was invited to a Chef’s Table, a private dining area off the kitchen of the hotel where guests enjoyed an elegant meal with then Chef Paul Bellegarde. We dined on blue corn crepes filled with quail in an exquisite sauce. I was naïve enough to ask Chef Paul for the recipe. He pulled an old chef trick on me. He gave me the list of ingredients, but no quantities and told me to figure that out for myself. I made the blue corn crepes a few times and filled them with chicken in an herby sauce; they were quite passable. I have never tried to cook quail and don’t really know if I could find them in El Paso. I know there are some in a flood control basin near my house, but I am not a hunter, especially within the city limits. As I thought about what to do with my leftover batter, I thought about Chef Paul and the many great meals of his I enjoyed. He later served as chef de cuisine for the Hospitals of Providence and for the University Medical Center here in El Paso. As I worked out what might be a good thing to do with my batter, I decided on savory crepes with a chicken and green chile filling and sauce. I used measurements equivalent to half the original crepe batter and substituted corn meal and mesquite flour for the white flour. Mesquite flour has a nutty/sweet flavor and made a good tasting batter. The corn meal added a little texture and helped hold the batter together. I combined the left over batter and my amended version. That gave me six good-sized crepes and one not so good that became my test taste and reward for all the work. I felt I was on the right track . 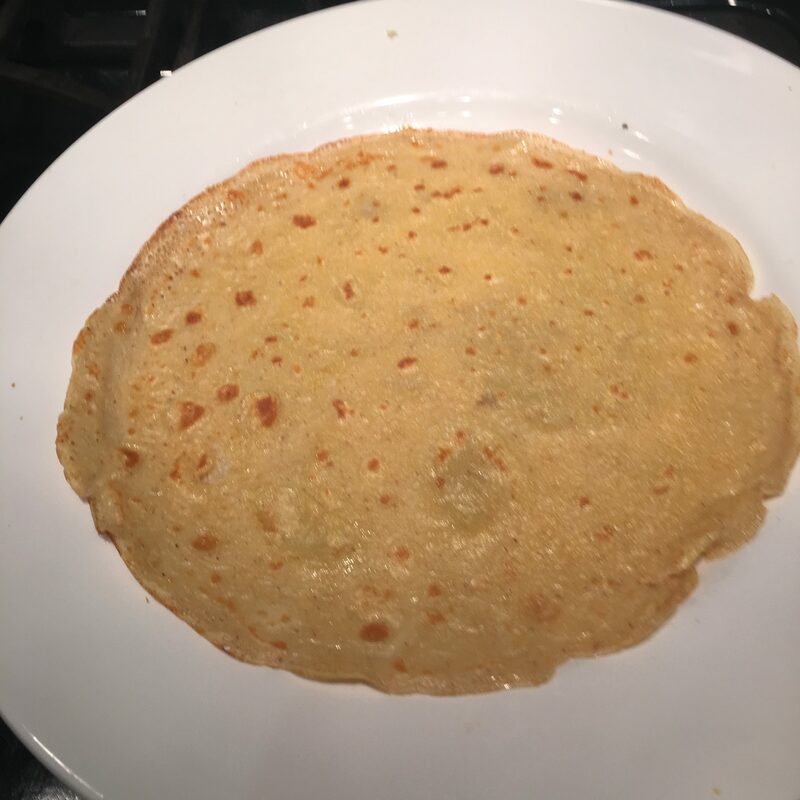 It was still morning, so I made my crepes, let them cool, layered them between sheets of waxed paper and refrigerated them until evening. Crepe cooking in a shallow skillet. For my sauce, I sauted onion and garlic, added low sodium chicken broth and then boiled two chicken thighs and about ¾ lb of chicken breast to make an enhanced broth. I skinned the thighs and removed the bones, but boiled the bones in the broth. 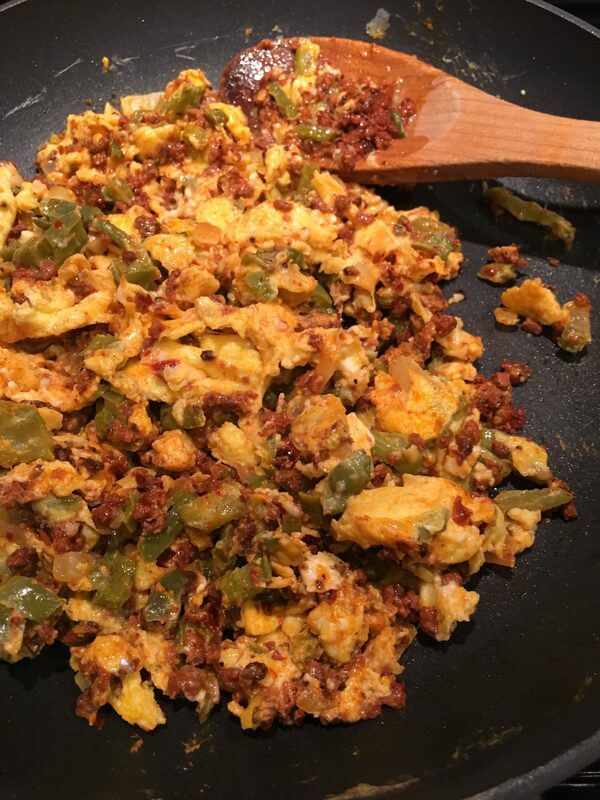 By the way, this was done without a recipe, but I am giving you the ingredients! When the chicken was done, I removed the meat to a platter cool a little and strained the savories and bones from the broth. I removed the thighbones and celery pieces and scraped the onion and garlic bits back into the broth. When the chicken was cool enough to handle I cut it into about a 3/8 inch dice, covered it and set it aside. I also diced a few roasted and peeled and green chiles. For garnish and kick, I brushed oil on a couple of jalapenos and lightly charred them on the grate of a gas range burner. As dinnertime neared, I made a roux using equal parts butter and flour. As the roux thickened and lost its raw taste, I began to add small amounts of the broth and stirred like crazy with a small beater to make a smooth sauce. When the sauce was simmering and of a good thickness, I added the diced chicken and chopped chile and brought it up to temp. I didn’t want the roux and sauce to be too dark in color because mesquite flours cooks dark by itself. I warmed my crepes in a pan and filled them with chicken and chile removed from the broth with a slotted spoon so they wouldn’t be too soggy. I wanted to tuck the sides and ends of the crepes to make a nice package on the plate. That’s not as easy as it sounds. It is a skill I’ll have to work on another day. 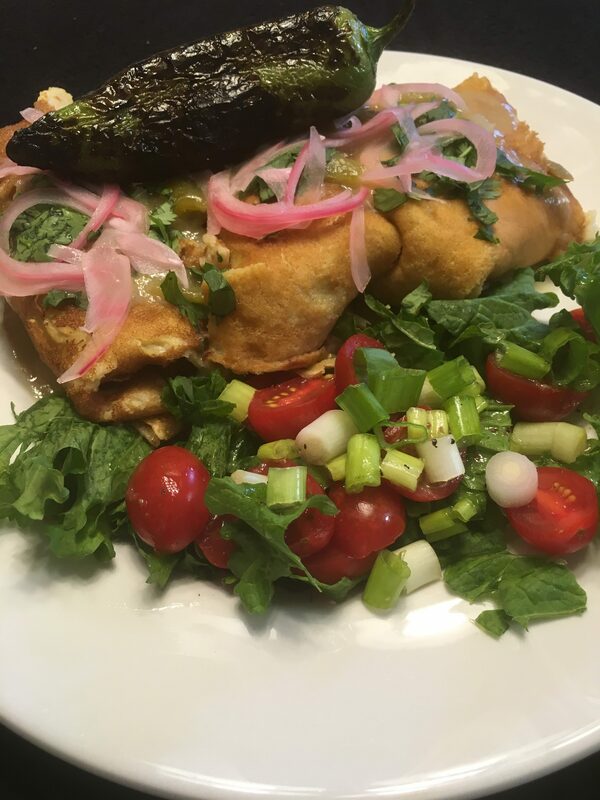 On the plate, I drizzled a bit of sauce over the crepes, sprinkled chopped cilantro and pickled red onions on top and served them with a simple salad. Cornmeal and Mesquite Chicken and Green Chile Crepes. A flame roasted jalapeño adds a little kick. I was very pleased with the texture of the crepes with the corn meal. It added a very subtle rich undertone to the dish. The mesquite flour made the crepes a little darker than they might have been otherwise. There was no sugar in the original recipe. The mesquite made the crepes a little sweet that balanced the rich chicken sauce. I had been worried about the sweetness, but it was just right. 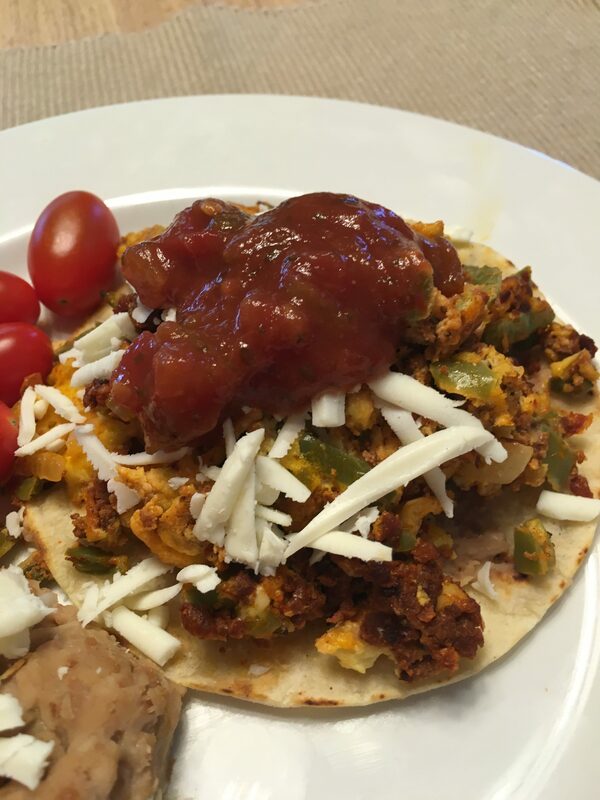 Below are the original recipe for the crepes and the half-recipe with corn meal and mesquite flower I developed. 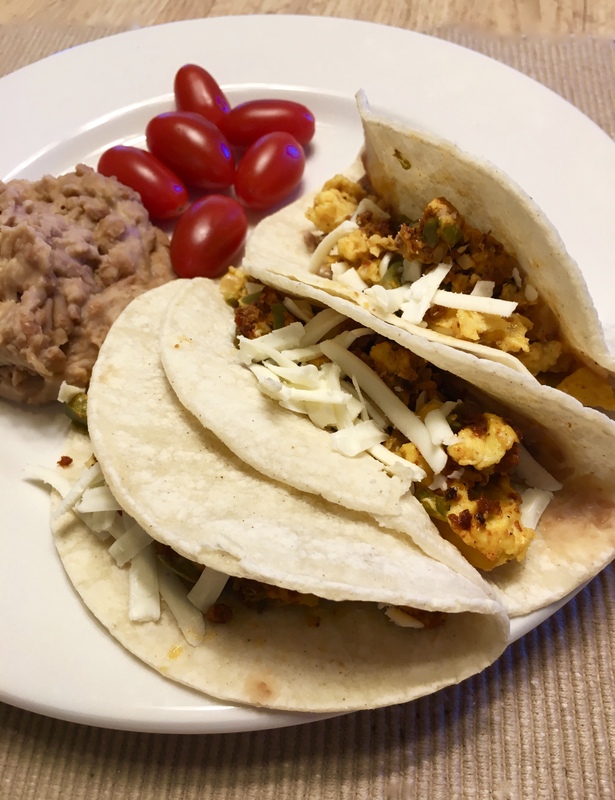 If you choose to try this recipe, you could use all corn meal – white, yellow or blue, and it would work. If you want mesquite, get food grade meal from a reputable source. I made the half recipe because I had what looked like half a recipe of left over batter to begin with. You could halve the original recipe or double the corn meal and mesquite version. Combine flour, milk, eggs and oil. Add salt. Heat a lightly greased 6-inch skillet; remove from heat. Spoon in 2 Tbsp. batter; lift and tilt skillet to spread the batter evenly. Return to heat and brown on one side only. 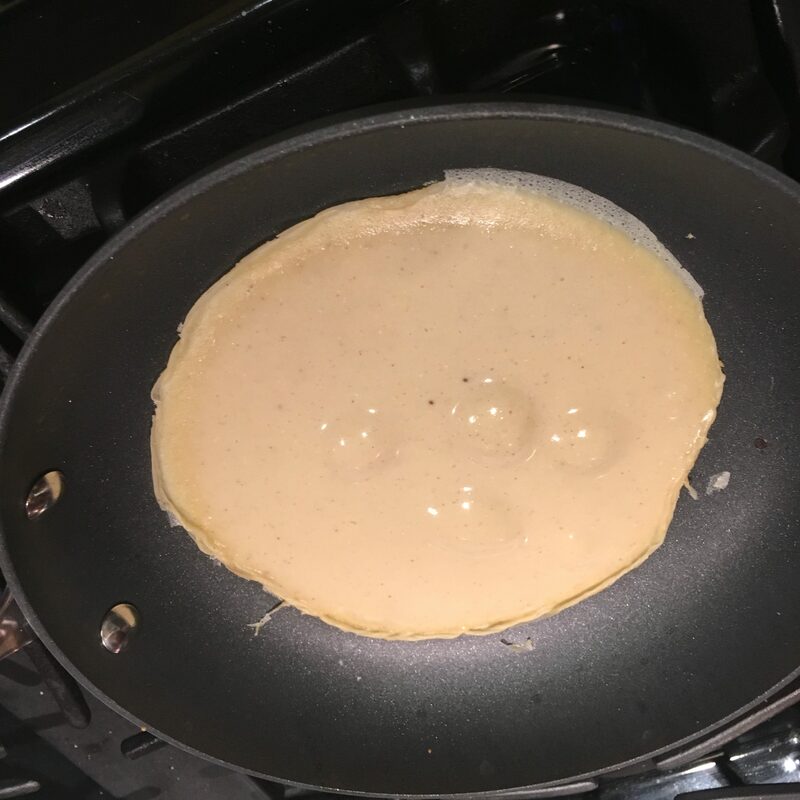 Carefully using a spatula, release the edges of the crepe from the pan. Peek under the edge to check doneness. Your batter and subsequent crepe are very thin, so you don’t need to brown both sides. To remove, invert pan over paper toweling. Repeat with remaining batter. Fill with your favorite filling. Note: You may add a Tbsp sugar to the batter if you are making sweet filled crepes. Combine corn meal, mesquite flour, milk, egg and oil. Add salt. Heat a lightly greased 8 inch skilled; remove from heat. Spoon in ¼ Cup batter. Lift and tilt skillet to spread evenly. Return to heat and brown lightly. This crepe will be a little bit thicker than the simple crepe above. Loosen the edge of the crepe all around and peek under the edge to check for doneness. The surface should be honey colored. Carefully take the edge of the crepe between the thumb and forefinger of each hand and turn it over. After a minute or so, that wide will be done. It will have spots of color and not be an even brown like the first side. Slide the finished crepe out of the pan onto a waiting plate. Repeat with remaining batter. Fill with a savory filling. Re-read the description above and cook the filling and sauce, or as Chef Paul instructed me, go figure it out and make it! I like pickled red onion as a garnish on dishes with green chile. I slice onion strings using a hand held mandoline (a chef’s knife works, too). I put a generous half cute of the onion strings in a glass measuring cup and cover them with white vinegar. I microwave them for a minute to a minute and a half and let them cool until needed. They become a very tasty garnish. *A few years ago the Mexican Camino Real hotel chair acquired the Paso del Norte and operated it. Sadly, it has declined considerably. The property has been acquired by and El Paso group who, this month, announced their intent to restore the hotel to its former glory and make it a showplace convention hotel. The city has given them 10 years of tax rebates to encourage the project. Let’s hope it becomes a star in downtown again. The Squeaky Wheel Gets the Oil and the Whiney Customer Gets Great Chops! I caught one of the good meat cutters at the market the other night. I fussed at him about having found no good looking pork chops in the meat case for a while. I don’t like boneless center cuts, especially if they are thin enough to read through. I like my chops at least an inch thick, and on the bone. Last night, I was delighted to find several packs of inch to inch-plus thick bone-in center cut chops. They were beautiful and I grabbed a pack of two 8 ouncers. and headed home to the grill. I decided top make the chops and sides “home” flavored. 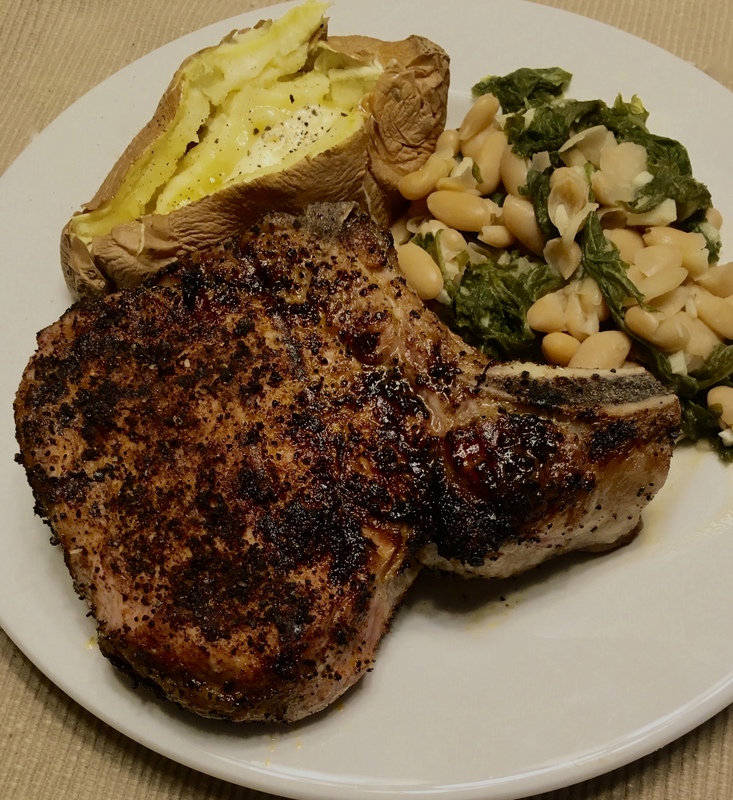 Grilled pork chop with a white sweet potato and beans and greens… comfort food for sure. I used Chef Vivian Howard’s Red Eye Coffee Rub on the chops. 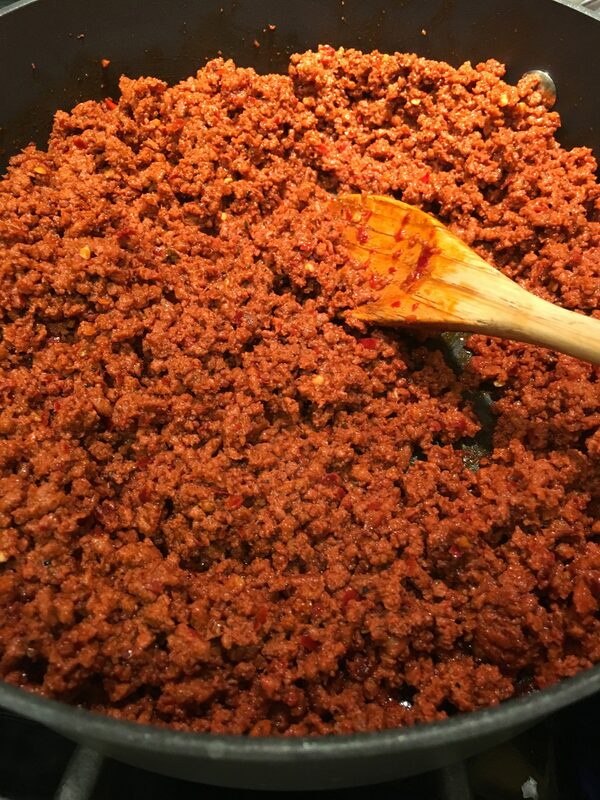 The rub includes brown sugar, ground coffee beans, coriander, cumin, garlic and a little New Mexico red chile. I let the rub sit on the chops while I worked on the sides. I zapped a couple of small white sweet potatoes which got buttered at the table. I minced a few garlic cloves and steamed them with torn mustard greens in a little chicken broth. I used a little salt and pepper and a couple of teaspoons of white vinegar on the greens when they were tender. The vinegar makes the greens less bitter. I then stirred in a can of rinsed cannellini beans. If you’ve read my blog before, you know I am really fond of beans and greens both as a side dish and in soups. I kept the sides warm while I worked on the pork chops. I fired up the grill and let all four burners get it good and hot. I put the chops on one side and gave them a few minutes on each side to sear them and get some grill marks. After turning them once, I turned off the two burners under them, lowered the temp on the burner closest to them to half and left the fourth burner on high. I rotated the chops a couple of times while the cooke on the “cool” side of the grill so they would cook evenly. After about 20 minutes, they reached an internal temperature of 135º, I took them off the grill, tented them and allowed them to rest for about 10 minutes. The rub darkened and caramelized while they cooked. Many sources say cook pork to 145º. I’ve dropped mine down to 135º because they will continue to heat while they rest. The remain a pale pink and are juicer than when I cook them to the higher internal temperature. Medium, pale pink and most pork chops from the grill. Hot and cool sides of the grill give the meet color and cook it evenly all the way through. I’ll be praising the meat cutter at the store and keeping my eye out for more of those lush thick chops! I ran into a posting of three no-cook pasta sauces. One really caught my eye and whetted my appetite. A green olive sauce wooed me and off to the market I went. I found a pricey can of green pitted olives in brine that weren’t stuffed with pimento and I was on my way! 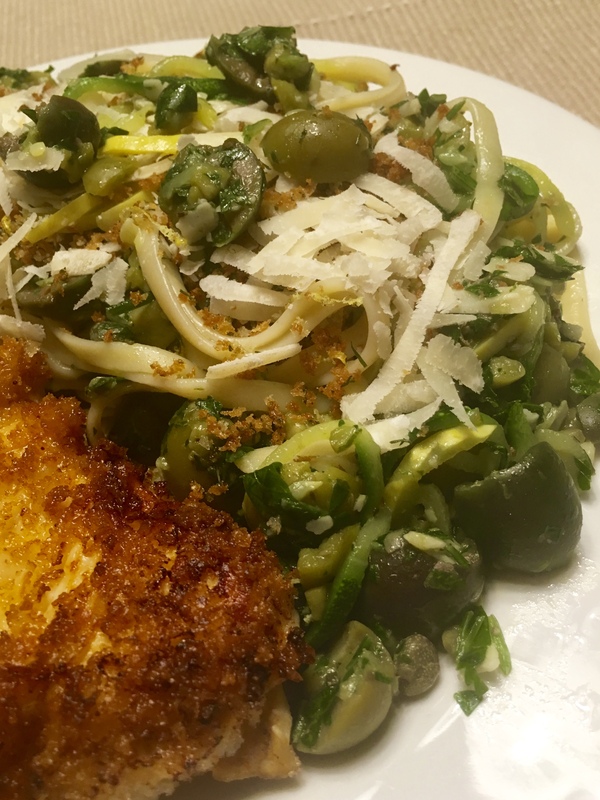 Green olives, capers and a garlic and anchovy paste sounded too good to be true. Combined with parsley and basil for balance, it was a real treat when combined with parsley and base. I did have to cook panko drums in a little olive oil and toss them with dill and lemon zest. Not a lot of work in that for a great flavored sprinkle on the pasta. And since I had oil a pan, I dredged chicken cutlets in flour, mild and more panko for protein. I can’t say it was Mama’s fried chicken, but it was a nice addition to the meal. I used linguine, but I supplemented it with spiralized green and yellow squash to reduce the carb content. I learned something from the recipe. The hole is a pasta spoon is to measure one serving of pasta. You would have laughed at me measuring my linguine. My wooden pasta spoon has a long slit instead of a round hole. I carefully threaded the linguine slot for two servings and it was just the right amount. The recipe is below. It says 30 minutes. I used canned olives and some fancy green olives with pits I had in the fridge. I had to pit those olives and even with a pitter, it took time. I must say it was worth the effort. As long as I’m whining I’ll say I grated the parmesan cheese sprinkled on everything. This sauce is so good, I won’t complain about the little bit of cooking the next time I make it. Meanwhile, mash anchovies and garlic to a paste on a cutting board with the side of a chef’s knife. Combine with parsley, basil, and half of olives and capers in a large bowl. 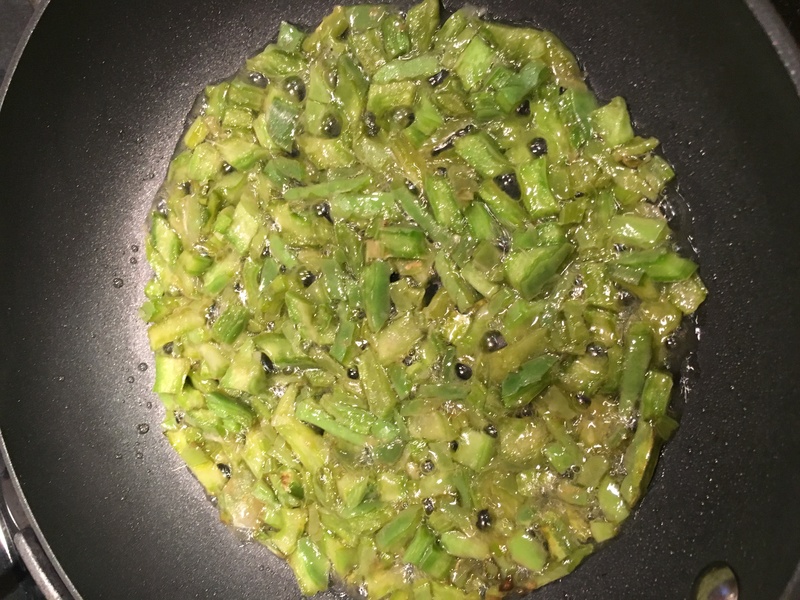 Chop remaining olives and capers and add to bowl, along with remaining ½ cup oil. Mix well; season sauce with salt and pepper. Add pasta and ¼ cup reserved pasta cooking liquid to sauce. Toss, adding parmesan a bit at a time, along with more pasta cooking liquid as needed, until sauce coats pasta. Add lemon juice; season with salt and pepper.Serve pasta topped with panko and more Parmesan. Make Thyme for Wine jelly as a baste on chicken breast cutlets makes dinner very special. Kelly Wiseman of Wiseman’s Garden Creations gave me a treat and the honor of working with and reviewing one of her culinary original creations. Wiseman’s Garden Creations is the dream child of Kelly and Geoff Wiseman. The couple create and make wonderful jellies and pickles and sell them at Ardovino’s Farmers Market. I’m lucky enough to be able to sample them and to try different ways to enjoy them. Among my favorites are Kelly’s wine salts – finishing salts made with wines and kosher salt. The merlot salt makes a grilled steak stand up and sing on your plate and your palette. People don’t readily grasp the concept of wine salt until they try it. Kelly asked me to try her Thyme for Wine Jelly. She asked me to think of ways the jelly might be used. I’m game for anything trying anything she creates, so, I took a jar into the Gringo Gourmet Text Kitchen and went to work. The Thyme for Wine Jelly is made with Gewürztraminer, a wine that has been called a grown-up moscato. It has a higher alcohol content than moscato, more striking aromatics and lower acidity. It aromatics are described spicy and citrusy, a little sharp with a smoky aroma similar to burned incense. The wine pairs well with duck, chicken, pork, bacon, shrimp and crab. It works with soft cow’s milk cheeses and dried fruit. It works well with highly spiced aromatic herbs including cayenne pepper, ginger, clove, cinnamon, allspice, Madras Curry, Sichuan pepper, shallots, soy sauce, almond, rose water, lime leaf, bay leaf coriander and cumin. 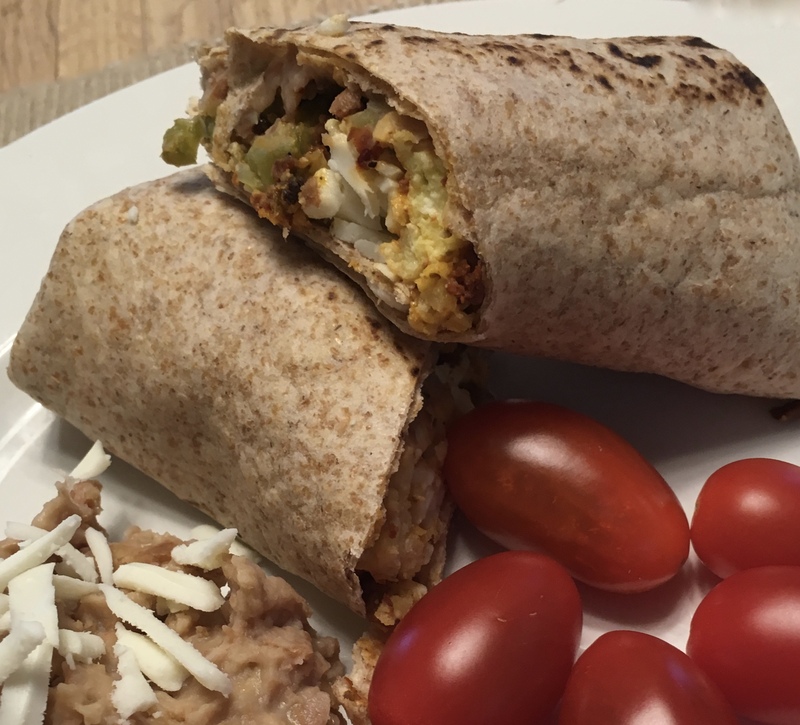 Another working category includes roasted vegetables and vegetables with a natural sweetness including coconut, red onion, bell pepper, eggplant, tempeh, squash and carrot. When Kelly added thyme to the wine, she created and explosion of flavor that was almost peppery. The first taste on a spoon ignited my taste buds. A second taste wooed me and I had to have a third. I personally wouldn’t put this on toast and immediately thought of is as a glaze for meats and poultry. As I tried the jelly as a finish baste on proteins, I felt was the jelly was a little thin for standing up to heat. When brushed on meats, it melted down and rolled off. I had to let meats rest and then brush them with the jelly. A thicker set might make it possible to caramelize the jelly. Caramelized bits from the fond in the pan were excellent when spooned over the meats. My first test was with pan roasted chicken leg quarters. I love dark meat chicken because it is juicy and flavorful and doesn’t get dry the way white meat can. I basted the thighs three times to get enough of the jelly on the meat to stick well. I served the leg quarters with patty pan squash stuffed with green chile and a little cheese and a salad of lettuce leaf basil, fresh mozzarella and grape tomatoes dressed with a touch of Italian vinaigrette. The side dishes and the jelly finish on the chicken worked together. I pan roasted the chicken and didn’t get quite enough color on the skin. 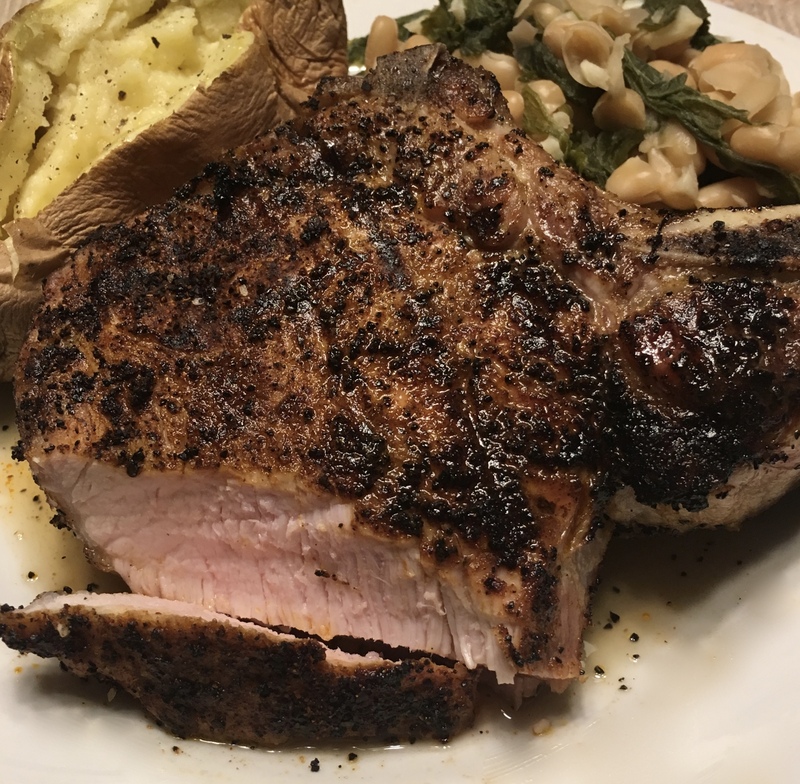 My next trial was an inch-thick center cut pork loin chop. I did a simple salt and sugar brine for a little over half an hour to help keep the meat moist during cooking. Again, it required multiple basteings of the jelly to remain on the chop. The chop was served with a Swiss chard and onion sauté with a finishing splash of red vinegar and a berry salad dressed with a strawberry yogurt and Thyme for Wine dressing. The chop was OK. The basting jelly complemented it well, but it didn’t set off any rockets for me. The hit of the plate was the salad inspired by a chat about the Thyme and Wine Jelly testing with my daughter. She said it sounded like it might make a good salad dressing. I made a mixture of three tsp. strawberry yogurt and two tsp. Thyme for Wine Jelly. The flavors were a very good match. 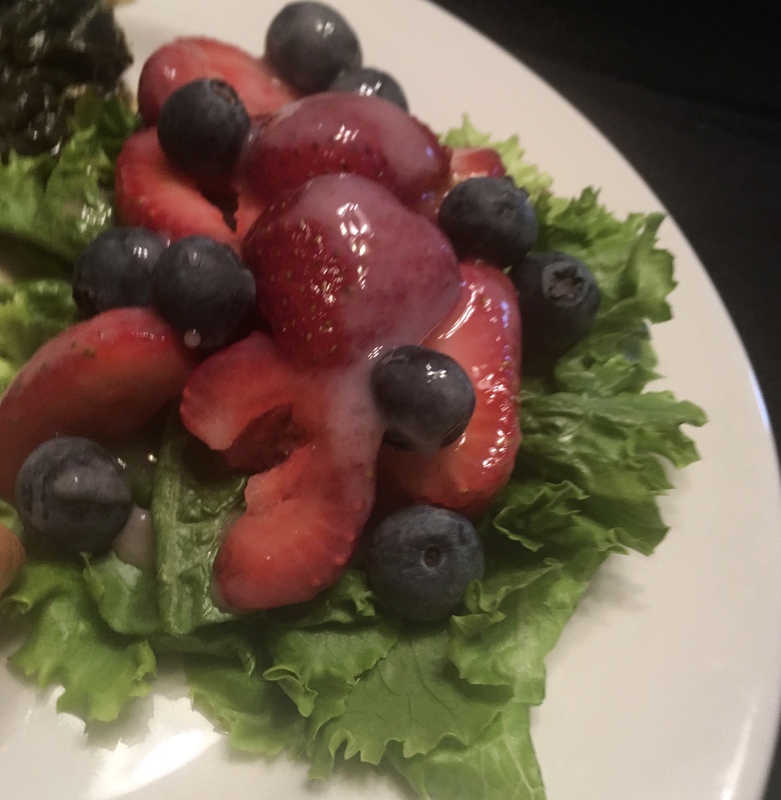 I tossed strawberries and blue berries lightly with the dressing and plated them on a bed of mixed greens. I drizzled the leftover dressing over it all. I will say that this salad is worthy of a repeat run… perhaps with a little toasted slivered almond sprinkled on top. Make Thyme for Wine and strawberry yogurt on berries over lettuce – a great jelly turns into a fantastic salad dressing! My third adventure was chicken breast cutlets, pan roasted and simply seasoned with salt and pepper. I pounded the cutlets to an even thickness and browned them in a pan with a little olive oil cooking spray. They colored up well and, because of their shape, held the jelly baste nicely. I used some of the pan sauce that had caramelized on the cutlets with a couple of bastes of the jelly. A garnish of a few springs of fresh thyme was nice. Mixed greens with radishes and grape tomatoes and steamed fresh green beans with paper thin slivers of ham and baby onions rounded out the meal. The Thyme for Wine Jelly is amazing. The spark of thyme and the medley of tastes and aromatics of the wine jelly are a pleasure on the tongue. I do wish the jelly had been a bit thicker to hold up to head. I liked the jelly baste on the chicken breast cutlets. That and the dressing on the berry salad were my favorites. In second place, I put the leg quarters. Cooked skin-on, they were a little over powering for the jelly baste. As I said, the pork chop was OK, but it needed a stronger basting sauce than did the chicken entrees. Visit the Wiseman Garden Creations booth at the market and treat yourself to some wonderful jellies and pickles and be on the lookout for the specialties Kelly develops!